Blink Orc. Card Artwork. Monster Type: JourneyOrc leaping from time to time, from body to body, until he makes the leap back home. The Blink Orc is an odd monster to encounter. It will be there one moment, then disappear the next. Teleporter is the first thought, but no, it gets more complex. 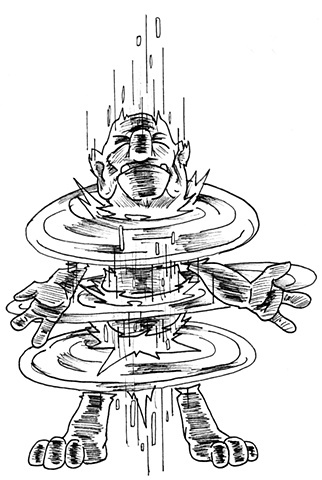 For the blink doesn't just teleport, it "leaps" into other bodies, more specifically, the bodies of your party members, acting like them while performing some task that will enable it to leave into the next body until the "leaps" back into its own body and back home. So, this monster is a toss-up, it can either be a hindrance or an asset depending on what unknown task the Blink Orc is made to perform. Adventurer's Tip: Should the Blink Orc blink out of an encounter, immediately perform the blood test on every member in your party, yourself included. Set aside several cups with labels of each member and heat up a thin piece of metal. Should the blood rise out of the glass upon contact to heat, then that person is the Blink Orc. Deal with it accordingly, unless the Blink Orc fixed the results, then it is best to engage in mortal combat with each other to be certain. The Blink Orc is a nod to Quantum Leap, in that the creature's text cites this as its reference. I wondered how to portray it, and just made it getting enveloped in a portal of energy as Sam Beckett leaps were mostly just a flash of light a bluish glow with dots to signify leaps. I did it as his first leap in the title sequence from memory and the test is a reference to the Blood Test in John Carpenter's The Thing.